The 'creation myths' of modern witchcraft and Paganism were decisively toppled at the turn of this century in Ronald Hutton's celebrated book, Triumph of the Moon. But did Hutton topple more than just myths? Are some truths also hidden in the rubble? Did paganism really die out centuries ago? Was witchcraft really no more than a fantasy? Were the Gods of Wicca really born out of the Romantic movement? Did Gerald Gardner lie about his initiation into witchcraft? 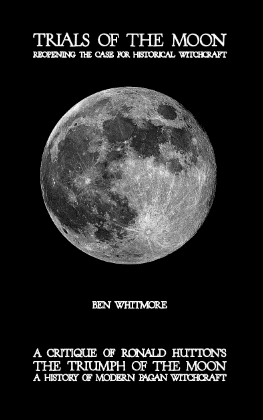 Ben Whitmore has retraced many of Hutton's steps, critically evaluating the evidence, and he now suggests that the truth may be quite different and even more fascinating. Drawing on a wealth of scholarly material, Whitmore demonstrates that the field of Pagan history is anything but barren ground — it is rich and fertile, and we have barely begun to cultivate it. We hope this book will appeal to serious Wiccans, witches and Pagan researchers alike.
. . . and order your copy here! Ben Whitmore is an Alexandrian High Priest, Co-Freemason, Morris dancer, artist and software engineer. He lives in rural Auckland, New Zealand, with his partner and daughter. In the interest of openness and scholarly rigour, I plan to publish any significant criticisms of my book on this page. Feel free to contact me via the witchvox website — the author. Robert Mathiesen (22/11/2010) pointed out that I had mischaracterised a document of Charles Leland's: I described it as "Leland's transcription from the original [Italian] manuscript" (p. 38), but it was in fact the handwritten copy of Aradia for publication, containing only brief Italian passages, which seem to be taken from a manuscript in Italian. "Gaius Cornelius Tacitus" (5/1/2011) believes my critique is incomplete, and that I have overlooked many errors in Hutton's account of Wicca, both pre- and post-1950s, and particularly regarding Wicca in North America. Max Dashu (21/1/2011) points out that the prayer to Earth from a 12th-century Old English herbal is probably based on a Graeco-Roman stylistic model rather than native folk religion. My wording implied a native origin (p. 23). Ronald Hutton (May 2011) has written a lengthy response to my book, as part of his article "Writing the History of Witchcraft: A Personal View" in The Pomegranate journal. I respond to his several points here. Peg Aloi (May 2011) gave a formal review of my book in the same issue of The Pomegranate. I respond to her several points here.